This spectacular photo of a polar storm on Saturn was taken by NASA's Cassini spacecraft on Nov. 27, 2012. It is a raw and unprocessed image. Amazing new photos from NASA's Cassini probe orbiting Saturn reveal a dizzying glimpse into a monster storm raging on the ringed planet's north pole. Cassini took the spectacular Saturn storm photos yesterday (Nov. 27) and relayed them back to Earth the same day, mission scientists said in a statement. The pictures reveal a swirling storm reminiscent of the recent Hurricane Sandy that recently plagued our own planet. The tempest is located in a strange hexagonal cloud vortex at Saturn's north pole that was first discovered by the Voyager spacecraft in the early 1980s, and sighted more closely by Cassini since then. The strange six-sided feature, which is nearly 15,000 miles (25,000 kilometers) across, is thought to be formed by the path of a jet stream flowing through the planet's atmosphere. 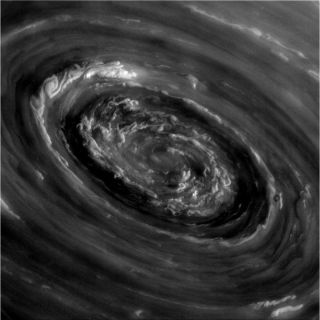 "Cassini's recent excursion into inclined orbits has given mission scientists a vertigo-inducing view of Saturn's polar regions, and what to our wondering eyes has just appeared: roiling storm clouds and a swirling vortex at the center of Saturn's famed northern polar hexagon," Cassini scientists wrote in an online update. Storms like this are common on many of the solar system's planets, including Saturn. "These phenomena mimic what Cassini found at Saturn's south pole a number of years ago," the scientists wrote. Saturn's mysterious northern vortex, a vast hexagon-shaped storm, dominates this photo taken Nov. 27, 2012, by NASA's Cassini spacecraft. This image is a raw and unprocessed view. Cassini, the first spacecraft to orbit Saturn, was launched in 1997 and arrived at the gas giant in July 2004. The probe has logged more than 3.8 billion miles (6.1 billion kilometers), and made some major discoveries about the Saturn system, including revealing the presence of hydrocarbon lakes on the moon Titan and spewing water geysers on the moon Enceladus. "Eight and a half years into our history-making expedition around the ringed planet and we are still astounded by the seemingly endless parade of new planetary phenomena," the mission scientists wrote.